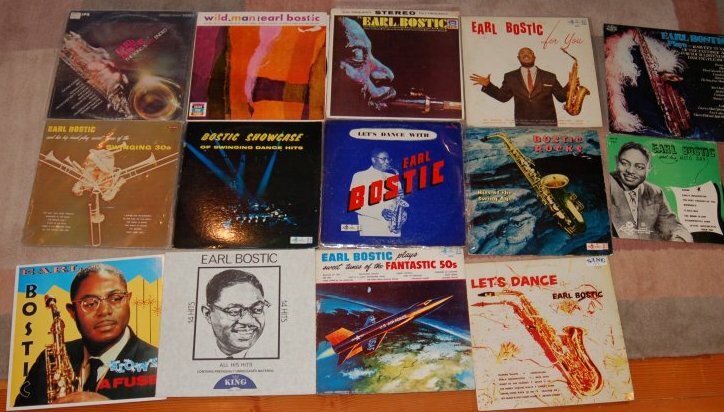 Earl Bostic (born Tulsa, Oklahoma April 25, 1913 –died Rochester, New York October 28, 1965) was an American jazz and rhythm and blues alto saxophonist, and a pioneer of the post-war American Rhythm and Blues style. Bostic recorded over 400 sides for King Records and sold millions of records. He could play faster and higher than any other saxophonist, and had a number of popular hits such as "Flamingo," "Harlem Nocturne," "Temptation," "Sleep" and "Where or When", which showed off his characteristic growl on the horn. Bostic is rumored to use a tenor sax reed on his Beechler mouthpiece. He played various alto saxophones, including Buescher and Martin models. The photo above was given to me by Elmer Beechler, the creator of Beechler mouthpieces, in his Van Nuys, California manufacturing warehouse which he shared with Arnold Brilhart, another innovative mouthpiece designer. Beechler knew Earl and spoke warmly of him. 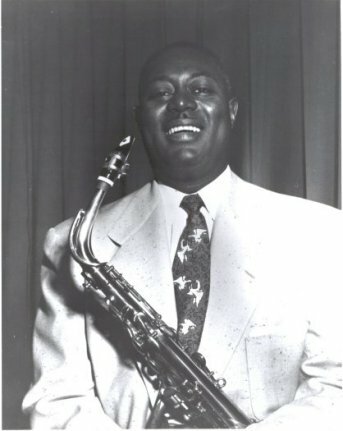 Bostic is holding a Martin Handcraft alto saxophone in the photograph. Here is an outstanding thesis on Earl Bostic written by Wesleyan College student Owen Callahan that includes an astounding transcription of Bostic's showstopping tune "Up There In Orbit." Are their any filmed performances of Earl Bostic? As far as I know, only one: Bostic acts and plays saxophone in this Stepin Fetchit film short "Lazy Richard." Bostic is in the opening scene knocking on the door, then later he plays a remarkable alto solo with a band, it sounds like a trumpet. Click here to see the film on Youtube. “Flamingo” (from The Very Best of Earl Bostic, Collectables). 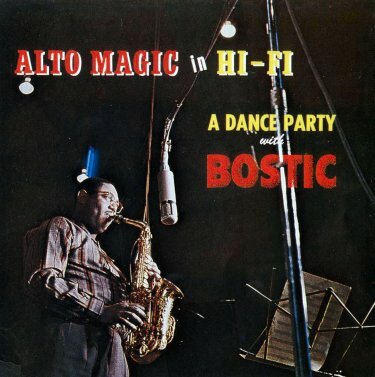 Bostic, alto saxophone; unidentified group. Recorded in 1951. Donaldson: I’m telling you, Earl Bostic was the greatest saxophone player I ever knew. I didn’t like him ‘cause sometimes he’d play stuff that I’d consider corny, [with] that wide vibrato and the sound of growling in the mouthpiece. But the man could play three octaves. I mean play ‘em, I don’t mean just hit the notes. He was bad. He was a technician you wouldn’t believe. But he never put those things on a record. And I asked him one time; “Earl, with all this stuff you can play”–and he said let me tell you something. “Don’t play anything you can play good on a record, [because] people will copy it.” And the man was dead right. Now you’d see him, we’d run up there and think that we’re going to blow him out, and he’d make you look like a fool. Cause he’d play three octaves, louder, stronger and faster. But he never put that on a record. I love those records. I used to practice them. Bostic was down at Minton’s and Charlie Parker came in there. They played “Sweet Georgia Brown” or something and he gave Charlie Parker a saxophone lesson. He was a swing player, melodic, and he could read anything. Great musician. "I recall being at Minton's Playhouse in Harlem around 1950 when Earl Bostic came to town and sat in. Coltrane was with me and we heard Bostic play in any key, any tempo, playing almost an octave above the range of the alto saxophone. We talked with him and he told us how each brand of saxophone should sound. He said, 'On the Martin you finger it this way, the Buescher is that way, and like so on the Selmer.'" 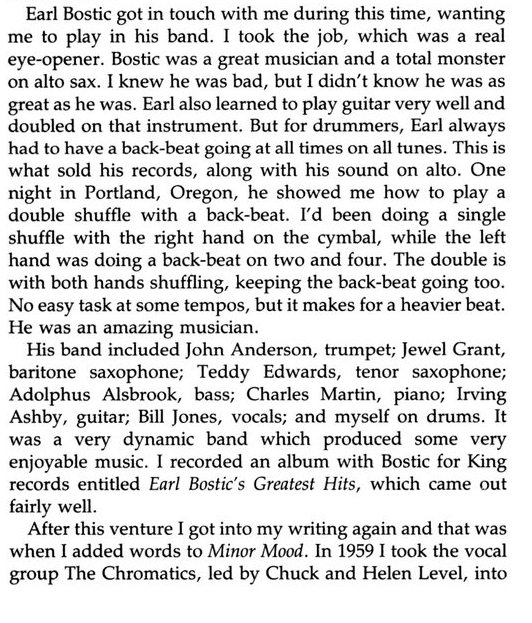 "I went with Earl Bostic, who I consider a very gifted musician. He showed me a lot of things on my horn. He has fabulous technical facilities on his instrument and knows many a trick." "He knows this instrument inside out, back to front, and upside down." "If Coltrane played with Bostic, I know he learned a lot. Nobody knew more about the saxophone than Bostic. I mean technically, and that includes Bird [Charlie Parker]. Bostic could take any make of saxophone and tell you its faults and its best points. Working with Earl Bostic is like attending a university of the saxophone." "Everyone in the Bostic band got along with everyone else. We were a playful bunch of fellows. All Earl ever cared about was that each musician could sight read on the spot. We had more than 150 tunes in the book, and if you couldn't read them the first time around you were out of a job." Roy Porter was a jazz drummer based on the West Coast. Here is Porter's recollection of working with Bostic. More content as I find it!